Saifu 阎焱: The ideal is that the underwear is a corset, and the outside is a lady. A recent article entitled "Dai Weicheng" Lao Lai is China's sorrow? The article was circulated on the Internet. 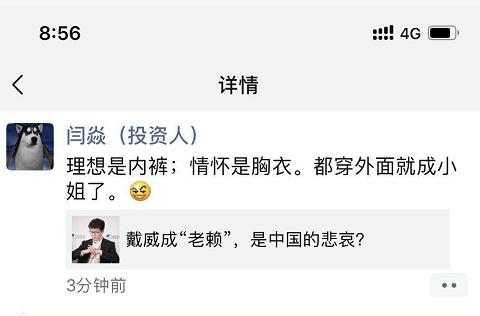 The founding managing partner of Safran Asia Investment Fund 阎焱 forwarded the article and commented that the ideal is underwear; the feeling is bra. They all wear outside and become a young lady. "Dai Weicheng's "Lai Lai" is China's sorrow? "This article quotes Xu Xiaoping's recent remarks: "Restricting Dai Wei's flight is a sorrow of this era." And this commentary said that the logic of some Chinese business elites has always been the case, you and him are fair, he and you talk about the contract, you talk to him about the law, he and you talk about feelings, in short, they are entrepreneurial, investment in the last life are Angel, if you are wrong, you can't say that you can't catch a crime. If you owe money, you can't be jealous... "It's so harsh to our entrepreneurs, who is going to start a business?" The article said that Dai Wei was restricted from flying because his company owed the supplier RMB 10,000 yuan and refused to comply with the law! This is not counting the billions of deposits owed to millions of users. The article concludes by summarizing that true idealists will not hang "idealism" at all. The opening of the external interface of the brokerage firm is not aimed at the reinstatement of the hot money.